Time flies when you're having fun, and Jackson is so much fun right now! He laughs and smiles and talks all the time. He sits on his own really well and loves playing with his toys. 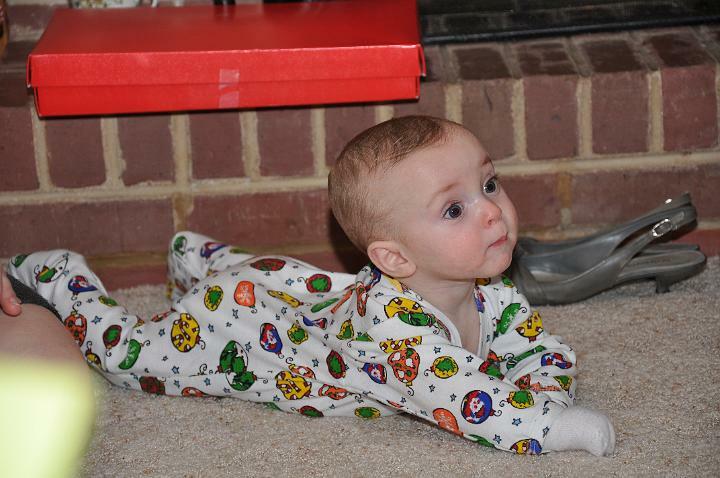 Although, his favorite toys are still Mommy and Daddy, and Mommy and Daddy's favorite toy is Jackson. 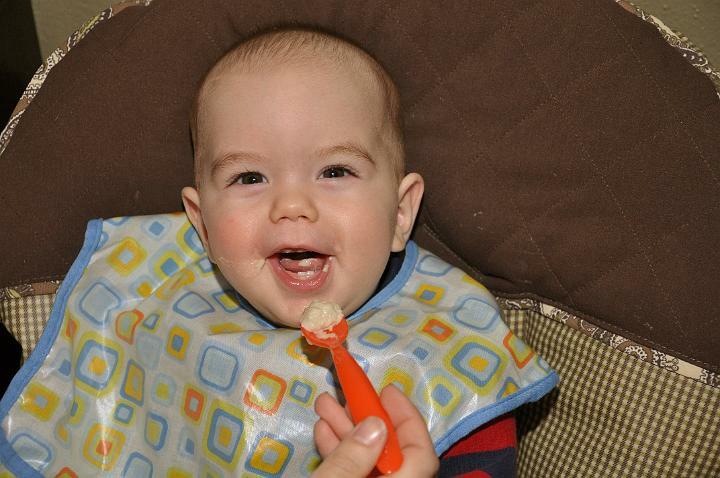 He now eats solids twice a day, and by solids I mean cereal and baby food. He naps 3 times a day but is still having trouble at day care. However, he still sleeps really well at night. He is usually asleep by 6 pm and sleeps until 6 am without getting up. 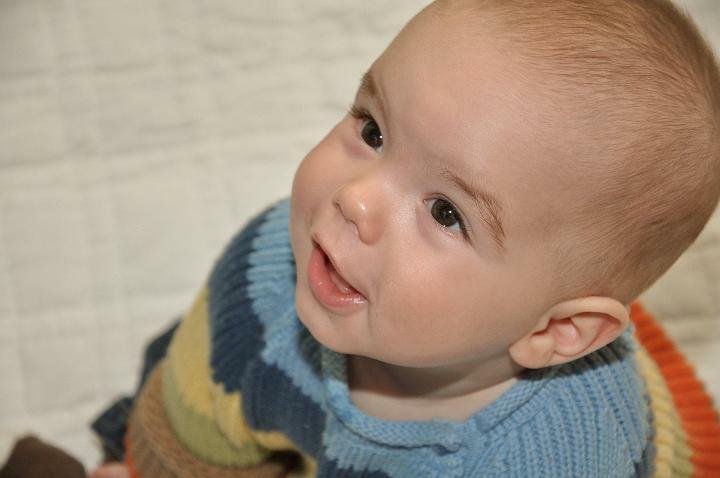 Have I mentioned he's the best little boy in the world?! 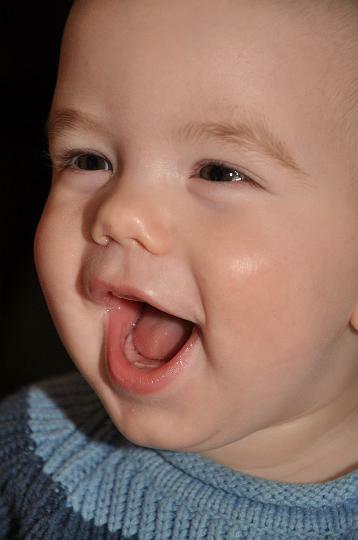 He has the best laugh in the world, which shows off his two adorable bottom teeth and is easy to evoke with even the right look. He was in such a good mood yesterday when we took these pictures that we got lots of great shots of that adorable smile! Ok, so we're not in trouble, but our pipes and guest bathroom are! A pipe in the attic from our hot water heater burst tonight and flooded the bathroom. Ross quickly saved the day. He managed to turn off the water and drain the hot water heater before too much water got in the bathroom. He is in the attic right now removing the insulation that got soaked so the ceiling can dry out. I guess we'll be calling a plumber in the morning and taking cold showers until it's fixed! Aside from that we've had a great weekend. We spent most of it hanging out with friends and enjoying our time with Jackson. We've been procrastinating on our "to do" list, so we still haven't even put away our Christmas decorations! 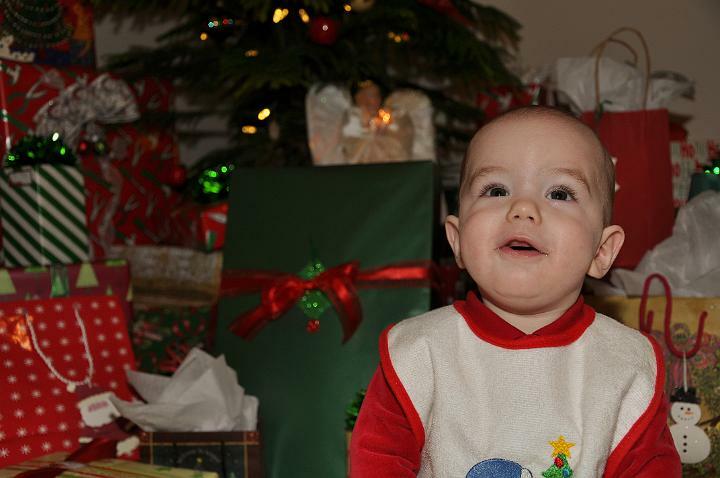 Christmas is normally a busy time of year for us, but this year proved to be a real challenge. 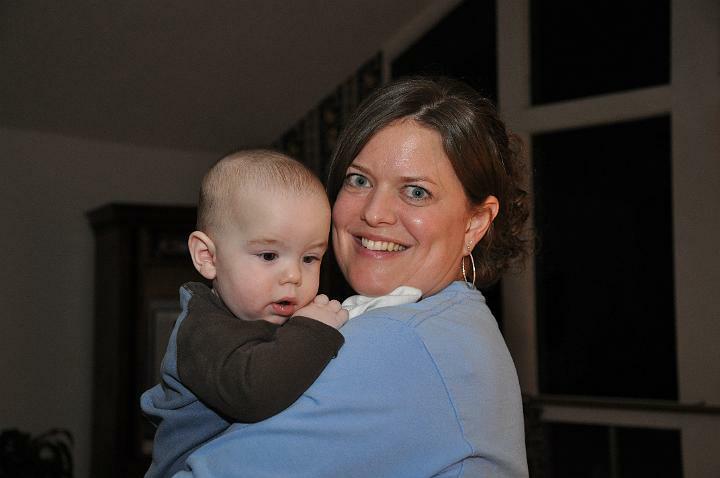 We were very much looking forward to Jackson's first Christmas, but the Monday before we found ourselves at the doctor's office with Jackson debating whether or not we should travel with a sick kiddo. He'd been running a fever all weekend and had an awful cough and runny nose. Turns out he had bronchiolitis and got his first round of antibiotics. With medicine in hand, we headed to Shreveport on Tuesday. During the trip I quickly realized I was coming down with something too, but Christmas must go on! Christmas Eve was spent with my Grandmother and Granddaddy and family. 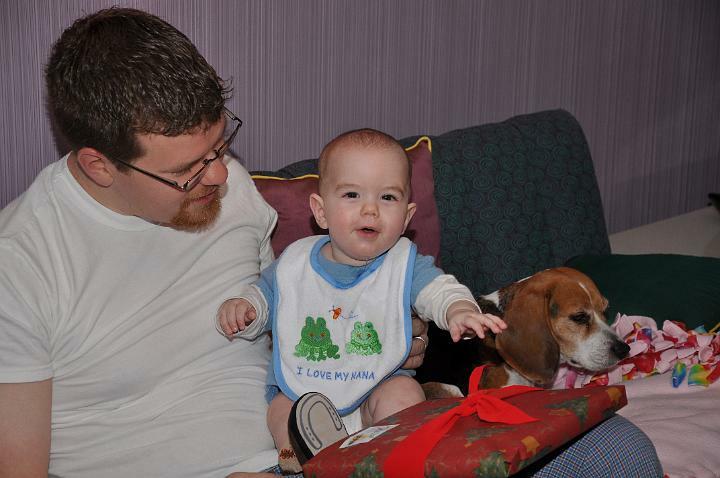 Jackson had fun hanging out with his 2nd cousins, Adam and Andrew. He was asleep before we started opening presents, but he got lots of love and attention despite being sick. He was quite the trooper. Despite feeling bad and running a fever he hardly ever complained. We had fun watching Adam open his gifts and help us open ours. 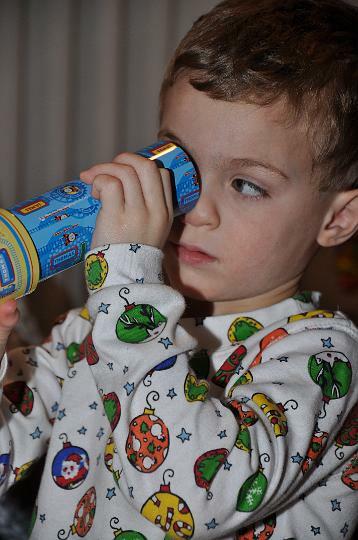 There are lots of pics in the album, but Adam opening his kaleidoscope was one of my favorite memories from this Christmas. Of course, he had no idea what it was, so it was fun watching him figure it out! Andrew is such a cutie! I've never seen such big beautiful eyes on a baby before! Christmas morning we woke up at my parents house, exchanged gifts, and had fun watching Jackson open more presents. It was pretty funny to see him sitting around in his diaper and new cowboy boots while he reached for bows and shiny paper. By that point I was pretty miserable. There's not much you can take while you're nursing, so I just tried to keep going...Next stop was Ross' parents' house where we had brunch with family and opened more presents. Ross' Uncle Ronnie and his kiddos, Jessie and Jordan, were my heroes that day because they left in the middle of everything to get me some Tylenol to try to help bring my fever down. Jackson was the center of attention and adorable as always! Jackson and I both got a good nap that afternoon before heading over to Ronnie and Laura's for more good family time, which rounded out our Christmas day, but not the last of our Christmas celebrations! The next day I finally broke down and called my doctor who graciously called in a prescription for me since we were out of town. 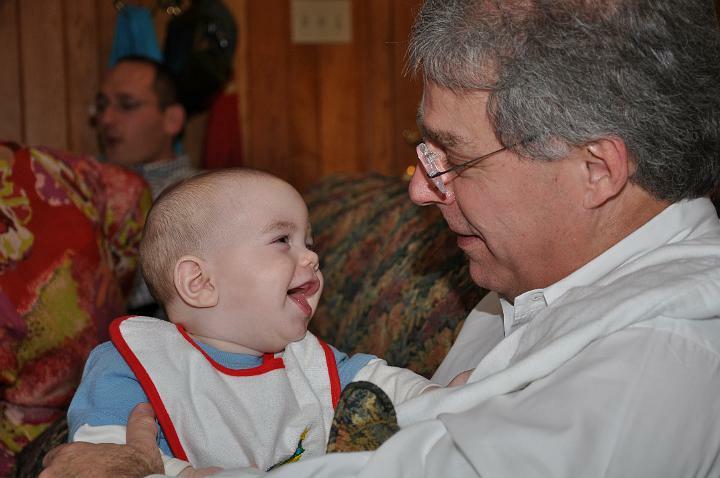 We picked up my antibiotics on the way to Ruston where we celebrated with my Dad's family. I have 3 boy cousins on my Dad's side of the family, and one of them got married this summer (on Jackson's due date! ), which meant I wasn't the only girl granddaughter this year! Not only were David and Rachel there, but John brought his girlfriend, Sarah, too! It took every ounce of energy I had to visit with everyone, but it was so much fun. David and Rachel moved to Kansas City this year where he's going to dental school and she's working as a preschool teacher. John finished law school and is preparing for the bar exam, and Ben is busy working on his mechanical engineering degree. They are an amazing group, and I love getting to see them. They were wonderful with Jackson too, which you can see in the album. Here's my Aunt Kathy meeting Jackson for the first time! I hope we can do as good of a job with him as she and Uncle Mike have done with their boys! The next morning I finally broke down and decided I either needed to go to the ER or take some medicine, which meant stopping nursing for a while. I opted to take some medicine for a few days in hopes of feeling better for our next trip to Leakey. Of course, by that time Ross was starting to feel bad too. We got one good day of rest before we hit the road again, and it certainly helped! When we got to Leakey we had our final Christmas celebration for this year with Ross' sister and brother-in-law. By this time you could tell that Jackson was feeling better, and we were so glad! 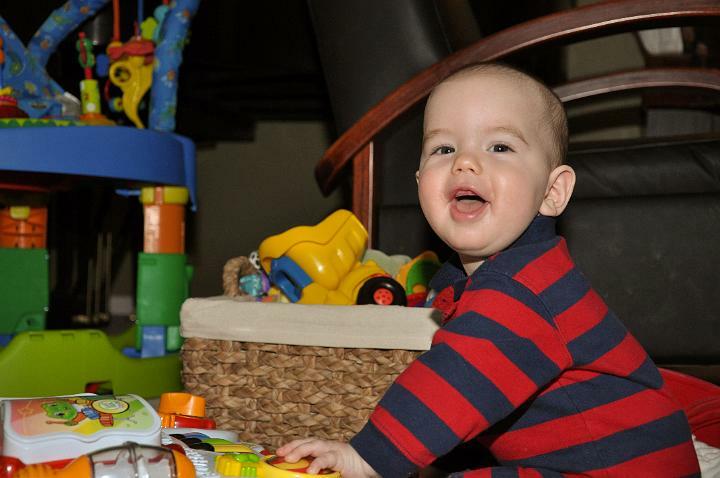 He loved all of his toys and getting to hang out with his Aunt Leslie and Uncle Philip! We spent several days in Leakey hanging out, riding on the ranch, and celebrating the New Year with family and friends. 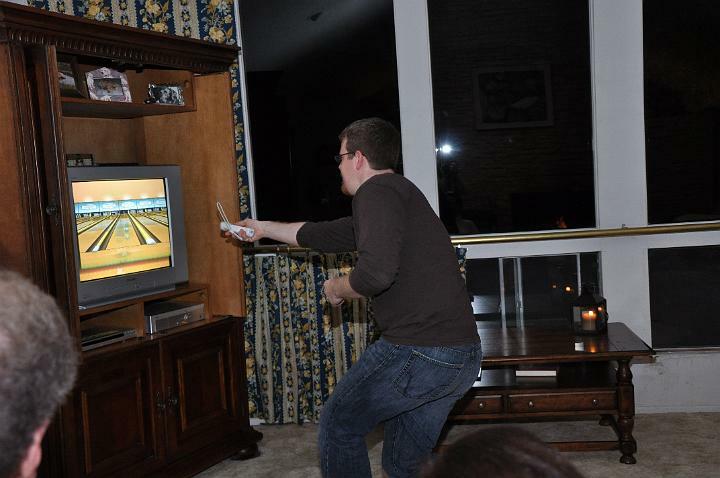 Philip got a Wii for Christmas, so everyone went bowling in the living room on New Year's Eve. It was a blast! Jackson got spoiled over the two week break, so we're working on getting back into a more normal routine today. I started nursing again a couple of days ago only to discover that Jackson has learned to bite with his new teeth! He finds it hilarious...not so funny to me though! We had a wonderful time with everyone, but we are exhausted and so glad to be home. Now it's time to get in gear for a new year! We can't wait to see all that 2009 holds. We hope everyone had a very merry Christmas and a happy New Year!